Background: Cancer is one of the most deadly diseases in the world. Cervical cancer is the second most common cancer in women worldwide. The major cause of cervical cancer has been found to be the infection with Human Papillomavirus (HPV). Out of over 100 types of HPV, the two types, which are considered high-risk HPV types, are HPV-16 and HPV-18. Several vaccines are available commercially which comprise Cervarix (Recombinant HPV Bivalent Vaccine), Gardasil (Recombinant HPV Quadrivalent Vaccine) etc. for the prevention of cervical cancer. In spite of the availability of many therapeutics for cervical cancer, the incidence of cervical cancer is increasing annually. Hence there is a strong need for new technologies for diagnosis, treatment and prevention to fight against this deadly disease. Objective: The paper presents a review of patenting scenario of therapeutics for cervical cancer to provide an insight into the technological trends during 2006-2016. Methods: The patent literature review spanning 10 years (2006-2016) was carried out in USPTO (www.uspto.gov) database, WIPO Patentscope database (www.wipo.int/patentscope), and EPO (www.espacenet.net) and relevant non-patent literature was searched using Scopus (www.scopus.com) and PUBMED (ncbi.nlm.nih.gov) databases and the World Wide Web. Relevant published patent applications, issued patents and non-patent literature were reviewed and excerpts were included in the present article. 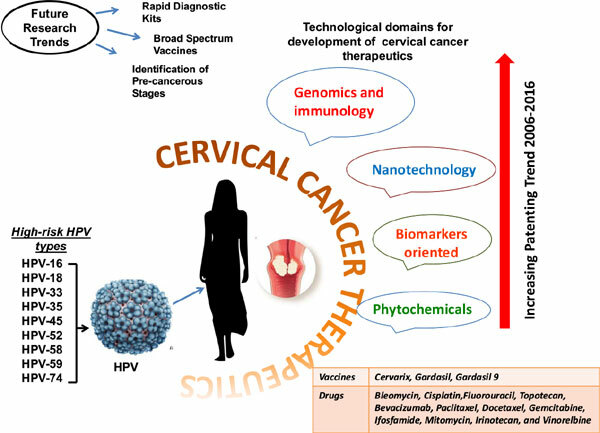 Results/Conclusions: Study of the patent profile of cervical cancer therapeutics during 2006-2016 reveals that much R&D worldwide has been focused on the development of therapeutics against cervical cancer resulting in the emergence of several potential therapies in various technological fields including DNA/RNA, peptide/protein-based therapy, nano-technological and phytochemical drugs, biomarkers oriented drugs and immune-therapeutics. In the end of the review article, the current and future directions of cervical cancer therapeutics are provided. Biomarkers, cancer therapy, cervical cancer, HPV, immunotherapy, patent trends.